Trick or treat! 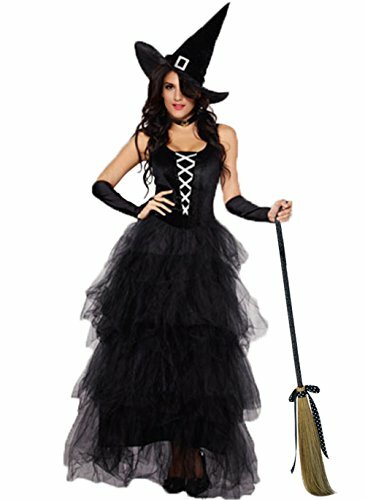 Your pretty little witch will have a grand time wearing this Halloween costume. 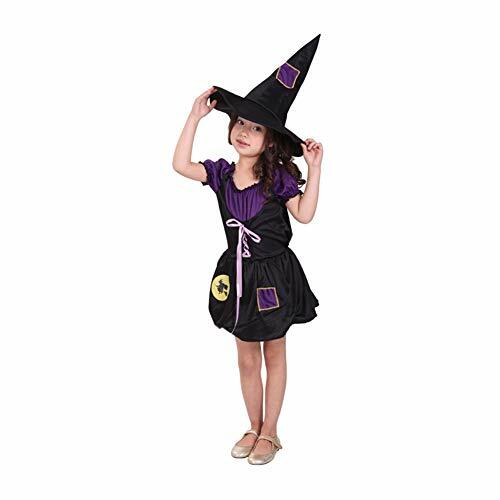 Each pack comes with 1 witch costume in medium size that is recommended for girls age 8-10. This value for money pack includes a Dress, Attached Braces, Hat, Tie, Arm warmers and Socks. 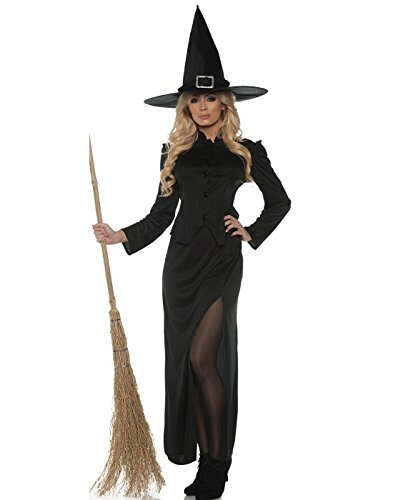 This pretty medium sized witch costume is perfect for school plays, performances, themed parties or Halloween parties. The loveliest witch you'll ever see-that's you! 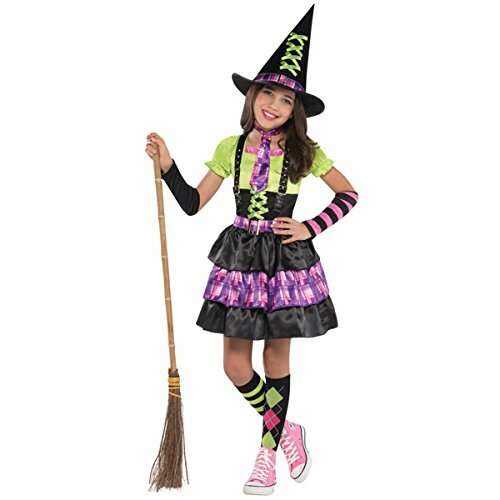 this Spellbound witch pack includes a dress, attached braces, hat, tie, arm warmers and socks.. this value for money costume comes in extra large size that's perfect for girls aged 14-16. 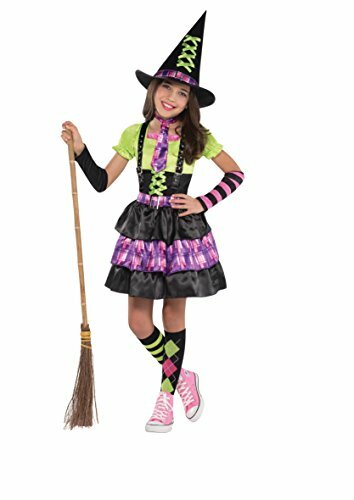 This halloween costume features a black dress with a green shirt bodice and ruffled sleeves, and attached braces and belt above the layered skirt of black and purple plaid. 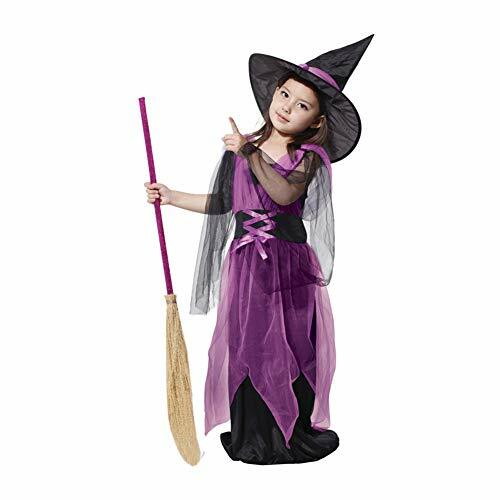 This lovely extra large sized witch costume is perfect for school plays, performances, themed parties or halloween parties. ★ Ideal for outdoor or indoor activities, perfect for Halloween and theme parties.Applicable gender: femaleApplicable age: childrenError range: 2cmRole playing: witchSuitable for the season: spring, autumn, winter, summerMain fabric components: polyester fiber (polyester)Color: as shownSize: M, L, XL,M height is 110-120 cmL is suitable for heights of 120-130 cmXL is suitable for heights of 130-140 cmProducts include: dress + hatWe have a variety of Halloween costumes in the store, if you need, please go to the store to see.Dear customers, if you have any questions or concerns, please feel free to contact us. 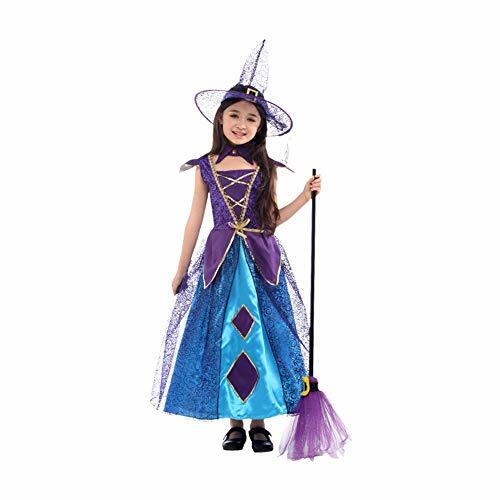 ★ Ideal for outdoor or indoor activities, perfect for Halloween and theme parties.Applicable gender: femaleApplicable age: childrenError range: 2cmSuitable for the season: spring, autumn, winter, summerMain fabric components: polyester fiber (polyester)Color: purpleSize: M, L, XL,M height is 110-120 cmL is suitable for heights of 120-130 cmXL is suitable for heights of 130-140 cmProducts include: dress + hatWe have a variety of Halloween costumes in the store, if you need, please go to the store to see.Dear customers, if you have any questions or concerns, please feel free to contact us. 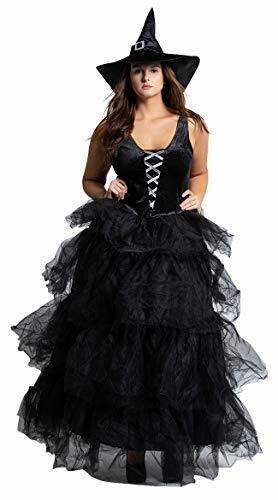 ★ Ideal for outdoor or indoor activities, perfect for Halloween and theme parties.Applicable gender: femaleApplicable age: childrenError range: 2cmRole playing: witchSuitable for the season: spring, autumn, winter, summerMain fabric components: polyester fiber (polyester)Color: as shownSize: M, L, XL,M height is 110-120 cmL is suitable for heights of 120-130 cmXL is suitable for heights of 130-140 cmProducts include: skirt + hat + ribbonWe have a variety of Halloween costumes in the store, if you need, please go to the store to see.Dear customers, if you have any questions or concerns, please feel free to contact us.